The Big Wobble: Guatemala's Volcan de Fuego (Volcano of Fire) erupting spectacularly. Amazing images have been captured of Guatemala's Volcan de Fuego (Volcano of Fire) erupting spectacularly. Authorities remain on high alert as it continues to display intense activity. The volcano, considered one of the most active in Central America, is being monitored by CONRED, the National Coordinator for Disaster Reduction of Guatemala, and INSIVUMEH, the National Institute for Seismology, Volcanology, Meteorology and Hydrology. Residents from the surrounding areas of Escuintla, Sacatepequez and Chimaltenango have been alerted to the possibility of a major eruption, according to Prensa Libre. On Friday, INSIVUMEH recommended raising the alert in the area, stating eruptive activity remained strong and is expected to increase in the coming hours. Some incredible photos and videos were captured by those in the area showing the glowing volcano in all its glory. This latest eruptive phase is classed as 'strombolian activity,' meaning it produces frequent eruptions, and began at 5.45am local time on Thursday. The ash column reached 4,800 meters above sea level, and a lava flow of more than 2km (1.2 miles) was reported. The volcanic explosions are causing rumblings, shock waves, lava flows and small pyroclastic flows, according to INSIVUMEH. Images of the flaming volcano's impressive ash cloud were also shared online by awestruck onlookers. 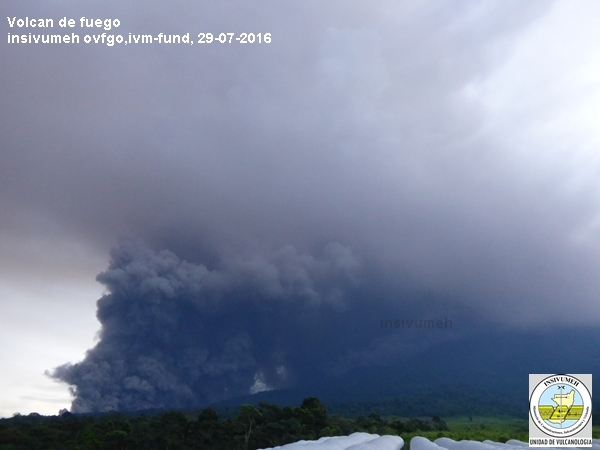 This is the 12th eruptive phase of Volcan de Fuego this year. In May an eruption resulted in evacuations in the vicinity.